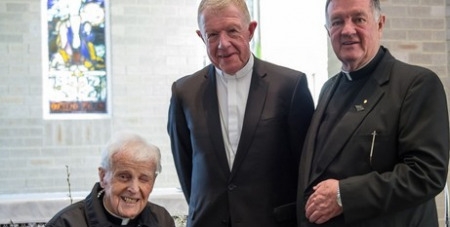 Sydney’s oldest priest has died at the age of 99, after an extraordinary 75 years of priesthood, reports The Catholic Weekly. Fr Frank Martin died on Monday at Sutherland Hospital. Bp Terry Brady, auxiliary bishop of Sydney, presented the Papal Cross to the priest at Stella Maris Aged Care Home, Cronulla, his home of many years. Fr Frank had entered the seminary at St Columba’s College, Springwood, at 15. After further studies at St Patrick’s College, Manly, he was ordained by Cardinal Norman Gilroy in 1940. He served three years in Tasmania, followed by appointments at Daceyville, Camperdown, Penshurst, Enfield and Concord parishes.